There’s a lot going on at the Ultimate Race Car Birthday Party. Toy cars speed down the Drag Strip, fly through the Roller Coaster and zip around the Giant Oval Track. 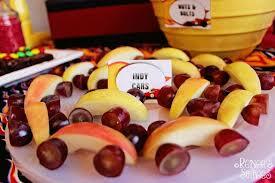 Amidst all the excitement, you might want to simplify the menu for your child’s birthday party. Do what a lot of other busy parents do– order pizza to be delivered. 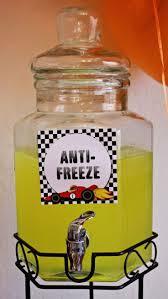 OR… you might want to put the pedal to the metal and offer refreshments with a race car theme. Hot Rod Mama, we’re here to help! 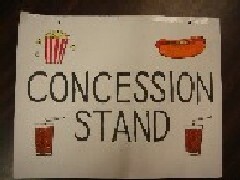 Birthday in a Box suggests serving hot dogs, nachos, soft pretzels and popcorn from a “concession stand”. Cover a rectangular table with a red tablecloth. Add a few race car decorations like black-and-white checkered flags, trophies or orange traffic cones. Then post a cute home-made sign like this one from Scholastic. 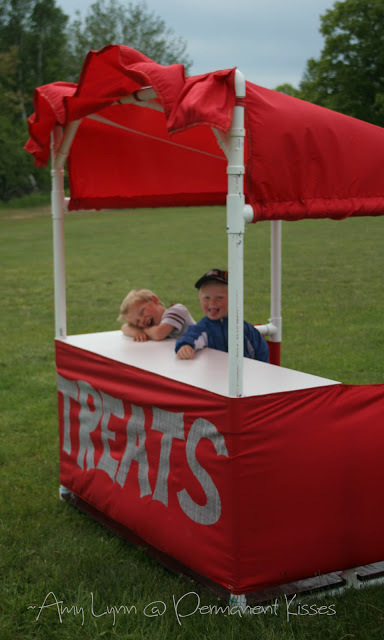 If you’re an avid DIY’er and want a more substantial structure– something you could use on other occasions– see how Amy Lynn of Permanent Kisses and her “ever supportive” husband used PVC pipes and red nylon fabric to build this fabulous concession stand. Let’s talk about creative food presentations. 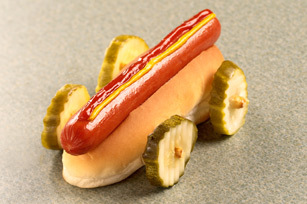 Kraft turns a hot dog into a “hot rod” with pickle wheels and ketchup-and-mustard racing stripes. 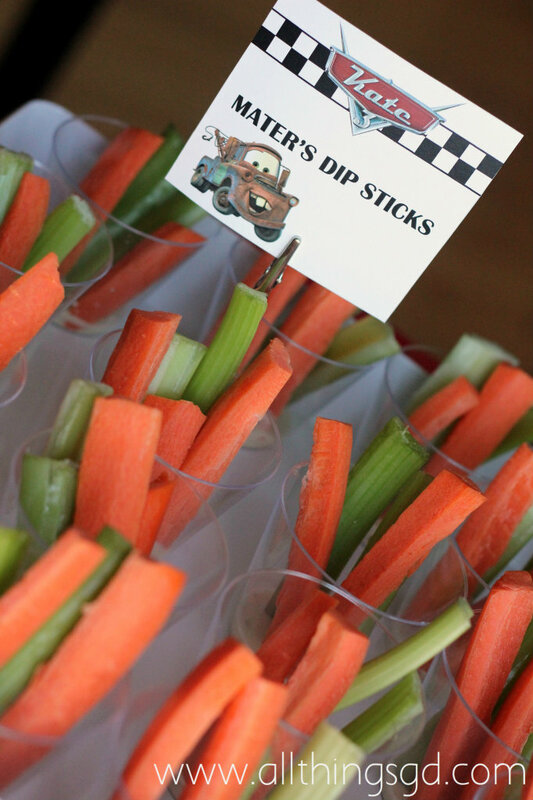 Dusty of All Things G&D cut carrot and celery “dip sticks” and put them into individual plastic cups. She filled the bottom of each cup with either ranch dressing or hummus. The cups are a great idea– neat and easy for kids to handle. Renee Roberts of Renee’s Soirees served sports drink "Anti-Freeze" and "Indy Cars" made of apple slices and halved grapes. Renee also prepared several race car-theme treats including chocolate-covered pretzel “dip sticks”, “spare tire” doughnuts and brownies topped with red, green and yellow M&M “stop lights”. We’ll close with two suggestions about birthday cakes. 1) If you live near the Los Angeles South Bay area, consider ordering a custom cake from King’s Hawaiian Restaurant in Torrance. King’s makes yellow, chocolate, vanilla chiffon, chocolate chiffon and orange chiffon cakes in a variety of sizes. The bakers are wizards at creating custom decorations based upon a photograph, a character or a theme— including race cars. 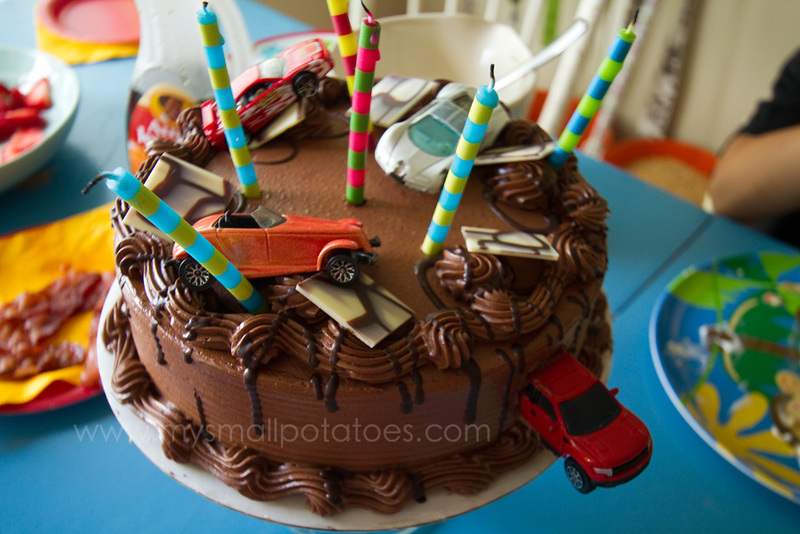 2) We love how Arlee of My Small Potatoes took a store-bought cake and decorated it with toy cars from her son’s collection. She propped up the cars on white chocolate “ramps”. Wouldn’t every mom’s heart melt to hear such praise from her child?